POLITICIANS who made a deal out of the depreciation of the Kwacha and spoke against Finance Minister Alexander Chikwanda over alleged failure to manage the economy should give credit to him for resuscitating the local currency, the Zambia Republican Party (ZRP) has said. ZRP president Wright Musoma said making wild allegation against Governmnet each time the country had challenges in various sectors had become some parties’ “daily bread” because they thought that was the only way of counteracting the strong policies Government was putting in place to improve the economy of the country. Mr. Musoma said it was hypocrisy of the highest order for some political party leaders to demonise Government each time there were challenges in the economy, but bury their heads in the sand each time such challenges were overcome. He said any sound-minded Zambian who had basic knowledge of business would attest to the fact that the performance of the economy of any nation depended heavily on international forces of demand and supply whose effects could not be ignored. Mr Musoma said in as much as opposition political parties existed to provide checks and balances to those in government, some leaders’ obsession for power was defeating the critical role parties played. “We challenge those who called Mr. Chikwanda all sorts of names when the Kwacha was nose-diving due to the low copper prices that were obtaining on the international market to give credit to him and the ministry now that the Kwacha has recorded a historical gain. “This political hypocrisy which some people have in Zambia whereby when things go wrong, the blame is heaped on Governmnet and when things are okay, we don’t recognise the efforts being put in place is not good. Let us cultivate a culture of giving credit where it is due and not always being negative,” Mr. Musoma said. He advised United Party for National Development (UPND) leader Hakainde Hichilema not to politicise the Kwacha gain but give an impartial interpretation of the state of affairs. “Mr. 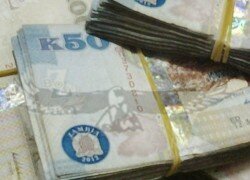 Hichilema and Wynter Kabimba have always being critical of the performance of the Kwacha. These are people who have tried to sway our minds from the reality on the ground that the Kwacha and economy were performing badly due to lack of prudent management. We want to hear their honest interpretation of its gain. “There is no person who has won an election based on lies. Zambians have always based their choice of leaders on merit and no amount of mudslinging will change their stance even in this election,” he said.